When I speak of "New Birth" I am always speaking of the birth of a new consciousness. What is called "new birth" is the birth into the spiritual life, the spiritual consciousness; it is to carry in oneself something of the spirit which individually, through the soul, can begin to rule the life and be the master of existence. You become a new person, and whatever your path or its difficulties later on, that feeling never leaves you. It is not even something, like many other experiences, which recedes, passes into the background, leaving you externally with a kind of vague memory that is difficult to hold, a memory that grows faint and blurred — it is not that. You are a new person and you are definitively that, whatever happens. And even all the incapacities of the mind, all the difficulties of the vital, all the inertia of the physical are unable to change this new state - a new state that makes a decisive break in the life of the consciousness. The being one was before and the being one is after, are no longer the same. The position one has in the universe and in relation to it, in life and in relation to it, in understanding and in relation to it, is no longer the same: it is a true reversal which can never be undone again. Birth into the true consciousness, that of the Divine Presence in us. Very tiny white or mauve starlike flowers with exserted stamens set in ball-like overlapping green bracts that arise from the leaf axils. Included in the significance are the small rounded very aromatic greyish green leaves. 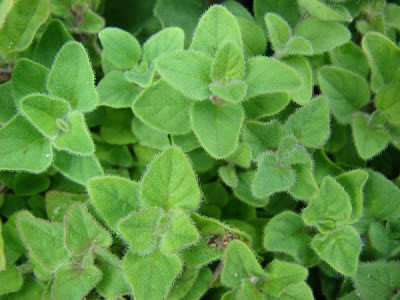 A perennial culinary herb. With its birth the mind will understand that it is only an intermediary and not an end in itself. 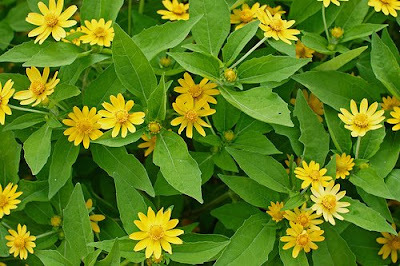 Small single yellow compositae flower with a dark brown centre; borne in leafy cymes. 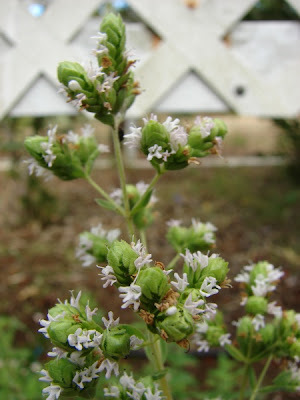 A long-blooming perennial herb.